After a meeting of politicians and leading figures from the renewables industry hosted on Sir Richard Branson’s Necker Island, seven Caribbean islands have committed to switching to clean energy. The three-day event, which took place last week, was organised by the Carbon War Room – a non-profit co-founded by Branson to promote business solutions to climate change – and the Rocky Mountain Institute energy group. Of the twelve island nations that attended, Saint Lucia, Dominica, The British Virgin Isles, Colombia, Turks & Caicos, Saint Kitts & Nevis and Aruba have pledged to work with the two organisations to begin their transition from fossil fuels. The signatories’ ultimate aim will be to provide at least 75% of their national electricity consumption from renewable sources, though some – such as Aruba – already have more ambitious long-term targets. To show how it can be done, Branson has agreed to use his private island as a “guinea pig”. He has awarded a contract to US company NRG Energy to update Necker Island’s energy infrastructure with an integrated system of solar, wind and energy storage technologies. The Virgin tycoon says that the Caribbean region can use its vast renewable potential to become not just a global example, but also energy self-sufficient. 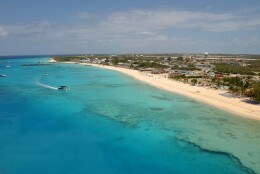 The former oil-producing island of Aruba provides a compelling case study. In 2012, the island set an ambitious yet achievable target of generating 100% of its electricity from renewables by 2020. After working with the Carbon War Room and the Rocky Mountain Institute to install a 30MW wind farm and update some of its infrastructure, the government says that electricity prices have dropped by 25% since 2009. David Crane, CEO of NRG, added, “With oil setting the marginal price of electricity, retail electricity prices in the Caribbean are among the highest in the world, hindering economic development, job creation and quality of life.